The Pentax 645z camera is now officially announced and all previous rumors are now confirmed, including the US price of $8,500 and the new 645 lenses for the US market. 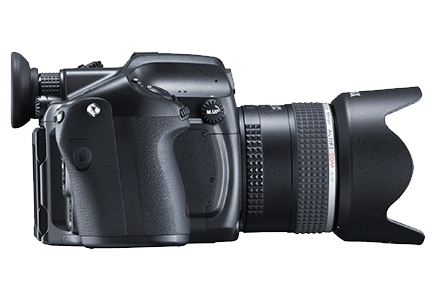 The new 645z is already available for pre-order at B&H and Adorama. Update: sample images taken with the 645z camera can be found here. 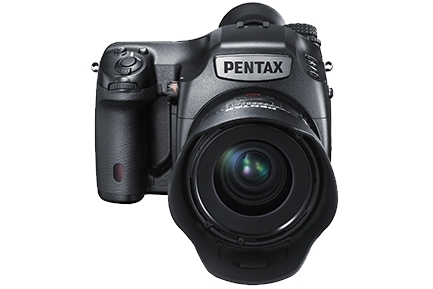 The PENTAX 645Z features a high-performance CMOS image sensor, with an imaging area (43.8mm x 32.8mm) approximately 1.7 times larger than that of a 35mm full-size sensor. 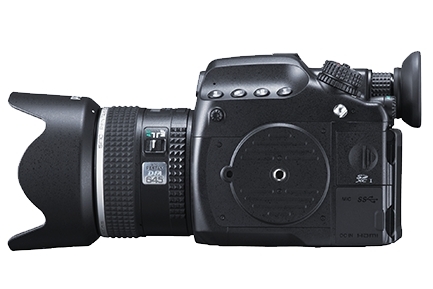 By combining this sensor with the PRIME III imaging engine — with its advanced image-processing and noise-reduction capabilities and anti-aliasing filter-less design — the 645Z makes full use of the imaging power and approximately 51.4 effective megapixels to deliver super-high resolution and exceptional depth rendition. Since the 645Z effectively minimizes annoying noise during high-sensitivity shooting, the photographer can comfortably take pictures even at super-high sensitivities up to ISO 204800. This provides the photographer with totally new creative options beyond the scope of existing medium-format photography. The 645Z continuously records as many as 10 images in the RAW format (or up to 30 images in the JPEG：L・★★★) at a maximum speed of approximately three images per second. It also offers quick-view function, UHS-1 speed class compatibility for high-speed data storage (in the SDR104 bus speed mode; with a compatible SD memory card), and USB3.0-standard data interface for easy transfer of recorded images to a personal computer. Thanks to its high-speed response, rivaling that of 35mm-format SLRs, the 645Z assures active, flawless shooting in a wide range of applications required by professionals. In addition to its wide-view design, the 645Z’s 3.2-inch high-resolution LCD display with approximately 1,037,000 dots (in the 3:2 aspect ratio) has a tilt mechanism to adjust the monitor angle, making it easier for the photographer to capture low- and high-angle images. Its front panel is made of tempered glass for extra protection. 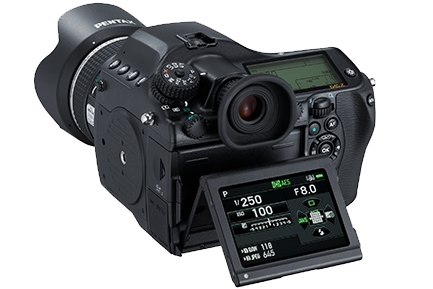 To optimize visibility during outdoor shooting, the LCD display features a unique air-gapless construction that eliminates the air space between the LCD layers to reduce the reflection and dispersion of the light, with an AR (Anti-Reflection) coating to minimize reflections on the screen. The 645Z captures beautiful Full HD video clips (1920 x 1080 pixels; 60i/30P frame rate) in the H.264 recording format. Its large image sensor is effective in recording shallow-depth videos with an effectively blurred background. In addition to the built-in stereo microphone, it also provides a stereo mic terminal for external microphone connection and an audio level control function. 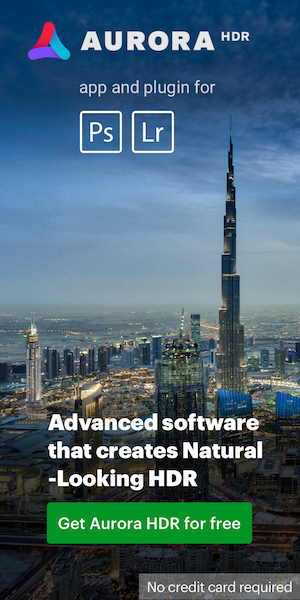 It even provides interval video recording of 4K-resolution images (3840 x 2160 pixels; in Motion JPEG or AVI video format) to add a new dimension in creative imaging. Both the 645Z’s exterior housing and the LCD monitor frame are made of sturdy yet lightweight magnesium alloy, while the chassis is made of diecast aluminum to optimize kinematic accuracy and thermal stability against excessive heat. The LCD panels — one on the camera’s top panel, another on its back — is covered with tempered-glass plates for extra protection against scratches. The 645Z is also designed for a durable and dependable shooting experience even in harsh outdoor conditions. 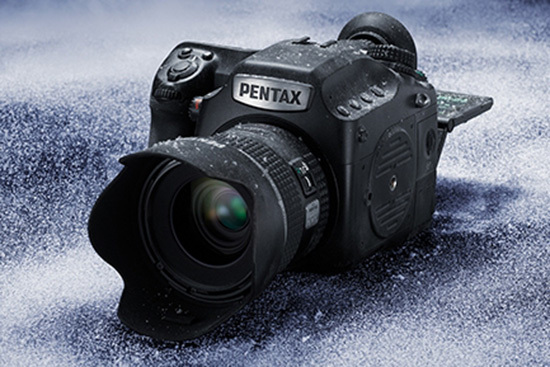 It’s not only weather-resistant and dustproof with 76 seals applied around the body, but it’s also cold-resistant against temperatures as low as –10°C, while its dependable shutter unit has withstood a punishing operation test of more than 100,000 shutter releases. 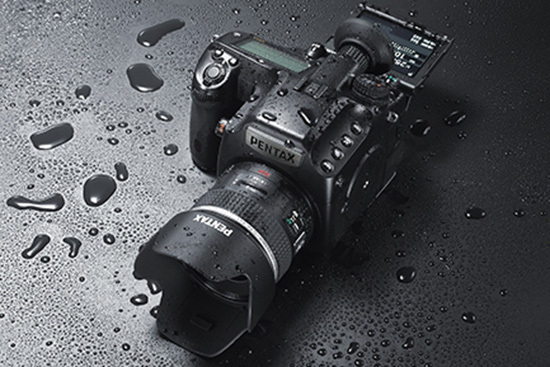 The 645Z features the innovative PENTAX Real-Time Scene Analysis System, which consists of an RGB light-metering sensor with approximately 86,000 pixels and a fine-tuned algorithm. This system not only assures much-improved exposure-control accuracy, but also utilizes the data obtained by the light-metering sensor to further enhance autofocusing accuracy and white-balance adjustment. By accurately assessing the type of scene or subject using the light-metering sensor, the 645Z not only selects the exposure settings that are more consistent with the photographer’s creative intentions, but it also makes a clearer distinction between the subject and the background to assure more accurate control of a discharge level in flash photography. 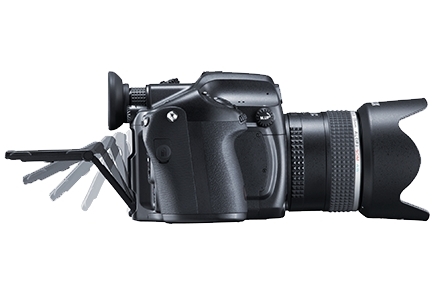 The 645Z features a trapezoid-shaped glass prism, in place of a conventional pentaprism, to assure compact dimensions. Its optical viewfinder provides a field of view of approximately 98% to facilitate image composition, while the time-proven Natural-Bright-Matte focusing screen offers a sharp, clear viewfinder image for easier focusing and reduced eye fatigue, even during extended shooting sessions. By installing the optional FLUCARD FOR PENTAX 16GB O-FC1 memory card in the 645Z, the user can release the 645Z’s shutter, check the live-view image, and browse and download the images recorded on the card using a smartphone. The 645Z comes equipped with the highly effective DR (Dust Removal) II mechanism to eliminate annoying dust spots on recorded images. By shifting the UV/IR-cut filter placed in front of the image sensor at supersonic speed using a piezoelectric element, this mechanism effectively and efficiently shakes dust off the image sensor. The 645Z also provides the Dust Alert system, which helps the user detect any dust particles clinging to the image sensor prior to shooting. Thanks to these user-friendly features, the photographer is assured of beautiful, spotless images, even when the lenses are changed in dust-prone outdoor settings. - When the camera is positioned upside down such as in copying work and bird’s-eye-view photography, the user can select “Auto Image Rotation mode” that allows the automatic rotation of the image 180 degrees on the camera’s LCD monitor or on a computer screen for easier viewing based on the selected position data. - The fine square grid on live-view helps you confirm the subject’s position in the image field during live-view shooting. The user can select grid color from black and white. - Lock button disables the camera’s control buttons and dial to prevent the accidental shift of settings. - Compatibility with IMAGE Transmitter 2 software, for easy transfer of recorded images to PC (optional; available soon). DENVER, CO, April 14, 2014 – It is not often that a camera can be referred to as a game-changer. One that can provide photographers with the tools that not only enrich their craft but are capable of producing images so distinct they are easily set apart from the competition. Today, Ricoh Imaging Americas Corporation is pleased to announce the game-changing PENTAX 645Z medium-format DSLR, thus altering the landscape of professional photography. Developed on the multi-award-winning legacy of the PENAX 645D and the historic PENTAX 645 film cameras, the PENTAX 645Z improves upon one of the most lauded cameras in the company’s 95 year history. Featuring an amazing 51.4 megapixels on a high-performance CMOS image sensor, the PENTAX 645Z assures super-high-resolution images with a stunningly realistic sense of depth combined with vivid colors and rich shadow detail. The resulting images feature a uniquely distinct look and an unmistakable brilliance that clearly differentiate professional photographers to their clients. 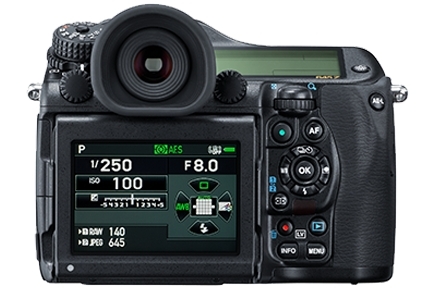 The thoughtful inclusion of a CMOS image sensor enables live view on a tiltable LCD panel while also making the 645Z the first and only camera in the medium-format category to offer video recording capabilities, resulting in footage that captures amazingly lifelike reproductions with tangible depth and incredible dynamic range. 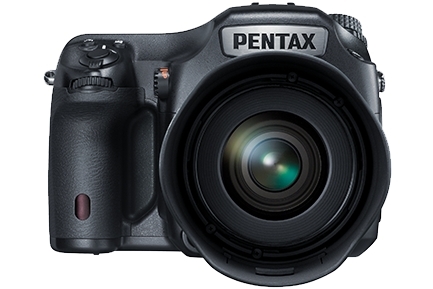 The new PENTAX 645Z has also received several significant enhancements including an improved and highly responsive shooting experience that can capture an incredible three frames per second—a significant benefit when compared to other medium-format cameras featuring CMOS sensors and an equivalent resolution—with a maximum shutter speed of 1/4000 of a second. The 645Z is equipped with an amazing top ISO of 204,800 for images with exceptional quality, even in situations with very low light or pushing for higher shutter speeds in all lighting conditions, providing the photographer with totally new creative options far beyond the scope of existing medium-format photography. Additionally, the 645Z is compatible with the recently introduced FLU Card, providing remote operation of the 645Z including the ability to release the shutter, view a live-view, and browse and download the images recorded on the card using a wireless connection to a smartphone, tablet, computer or any web browser enabled device. 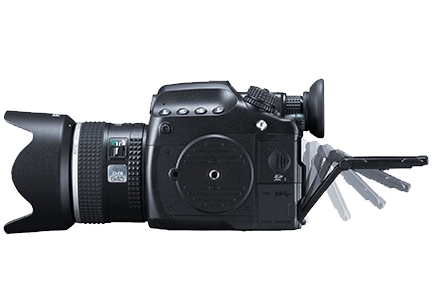 Widening the 645Z’s already diverse applications for shooting is an articulated LCD with a 3.2-inch LCD monitor with approximately 1,037,000 dots, ensuring even the most agile photographer captures waist-level, high and low-angle images with precision and ease. Finally, the PENTAX 645Z features an incredibly sturdy and dependable body with a magnesium alloy frame and a diecast aluminum chassis, complemented by 76 weather-seals for a cold-resistant, weather-resistant and dustproof shooting experience. In conjunction with the launch of the PENTAX 645Z, Ricoh Imaging is also excited to announce the availability of 13FA 645 lenses to support an even wider variety of optics providing the perfect system that spans numerous shooting scenarios. 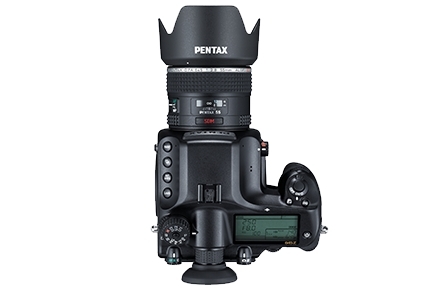 The PENTAX 645Z will be available for purchase in June 2014 for a category-low retail price of $8,499.95 for the body only. This entry was posted in Pentax and tagged Pentax 645z. Bookmark the permalink. Trackbacks are closed, but you can post a comment.